The very first question we almost always ask when we hear of a new film project is, are there are any creative elements attached? In the case of Barry Sonnenfeld’s latest, the answer is that there are actually six: Gold, Iron, Lead, Mercury, Tin, and Platinum. 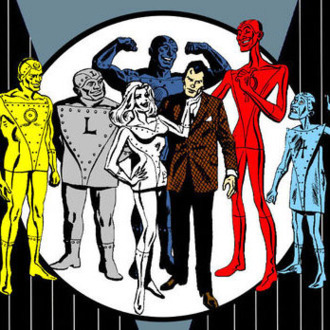 While the Men in Black 3 director has been circumspect about just which sixties comic book he’s adapting at Warner Bros., our spies tell us that Sonnenfeld has actually attached himself to DC Comics’ The Metal Men series. For those unfamiliar (and let’s be honest, that’s probably most people), The Metal Men centers on an artificial-intelligence expert named William Magnus who creates six cyborgs, each made from a distinct chemical element with talents reflecting their places in the periodic table: Gold, their leader, was almost infinitely stretchable; Iron, the strongman; Lead, the simpleton protector; Mercury, the capricious risk-taker who could melt into the tiniest crevices; Platinum, a female cyborg who could flatten herself but who couldn’t believe she wasn’t a real woman. Sadly, we’re still in doubt as to just what the sub-atomic talents of the self-doubting Tin are. Food preservation? Recycling? Refreshment? All three?